Something I've noticed while writing the Used Car Face Off every week is the apparent inability I have to write about many American cars from the '80s, '90s and '00s. I try, I really do, but very few of the cars from this era have aged particularly well. It's probably most apparent when you're looking at the big sedans of the period. Sure, today's Chevy Impala and Ford Fusion are good-looking cars that look like they were designed and engineered in this decade. Their predecessors? Well, you judge if either of these hot versions of boring sedans have any value today. 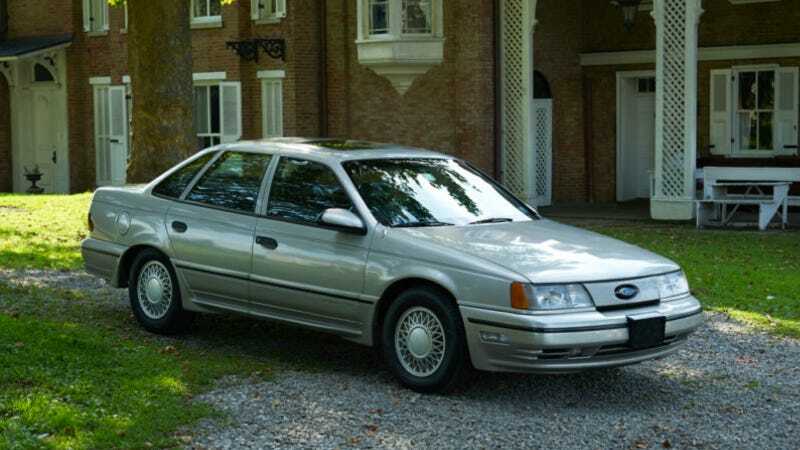 As revolutionary as the first-generation Ford Taurus was back in 1986, it has definitely been pulled into the undistinguished class of American cars of the 1980s. Most have rusted away by now and long forgotten. But the first-gen Taurus SHO? That's unquestionably a classic, as one of the best cases of what could be passed off as a government fleet car that happens to be hiding a thumping engine. Fantastic. That engine hiding under the hood of this 1990 Taurus SHO is the wonderful 3.0-liter Yamaha V6 with an astounding-for-the-time 220 horsepower. It would take another 18 years until a non-SHO Taurus would develop more than that. And mated to a five-speed manual with big wheels and decidedly '80s side skirts, it's just a great example of a bonkers midsize sedan. I love it. I also love that this one is so clean and so original, looks like it was used, but cared for, unlike so many other SHOs these days. Sure, it shows its age – it's a 23-year-old Ford after all, from a period that produced such undistinguished crap as the Tempo. The SHO, though, is the exception. But I can't blame you for wanting something more powerful and more modern. And, if you're not a Ford fan, a little more GM. You can't get much more GM than the W-Body Chevy Impala. This 14-year-old design, based on a 25-year-old platform, is still in production. It just won't die. A few years into the front-wheel drive Impala's existence, a hot version came out, the supercharged Impala SS. Then a couple years after that, they decided to wedge a small-block V8 into the W cars and things went crazy. A front-wheel drive, 5.3-liter Impala sounds like a ticket to torque steer city, which is something I'd be very interested in. But the old supercharged V6 cars are cheaper, hot-ish, and, well, cheaper. This 2004 Chevy Impala SS Supercharged Indy 500 Special Edition (take a breathe now) packs the ubiquitous 3.8-liter boosted V6 with 240 horses and a not-insignificant 280 lb.-ft. of torque, in contrast to the revvy Yamaha-engined Ford. It may do it through a four-speed automatic, but the Impala is really about effortless cruising. I could live with that. What's not so easy to live with is the sheer tackiness of the thing. That interior is so cheap and bland-looking and I have no idea what colors those are. They're just not on the spectrum. Then you've got the Indy 500 special edition logos everywhere, which are also maddeningly tacky. While this car may be more modern and have more everyday conveniences than the SHO, it's nowhere near as good looking or, even though it's a special edition, special. With that, I'll take the Taurus. The front-wheel drive Impala SS cars may very well be lost in the pages of history as time goes on, but the Taurus SHO will be pointed out as a very special American car from this bland period for years to come.